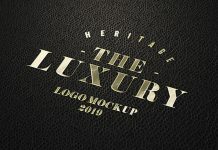 We are presenting today a free logo mockup created on textured paper. Picture is captured with a high depth macro shot fancy paper. Easily place your logo design, typography, lettering or logotype on smart object and get a super letterpressed effect for your logo design. You can change the background color behind textured card by applying fill on adjustment layer. Give your logo design an emphatic appeal and make your presentation count in front of your audience and clients.